* Cool perk: Employee Appreciation Day. Based on events throughout the year and employee personalities, the managers get together and dream up fun and creative employee awards. Two of the awards given: "Dedicated Sharpie," for the longest tenured employee who is ultradedicated to his team, and "Most Selfies," for constantly promoting the dealership with Toyota selfies. 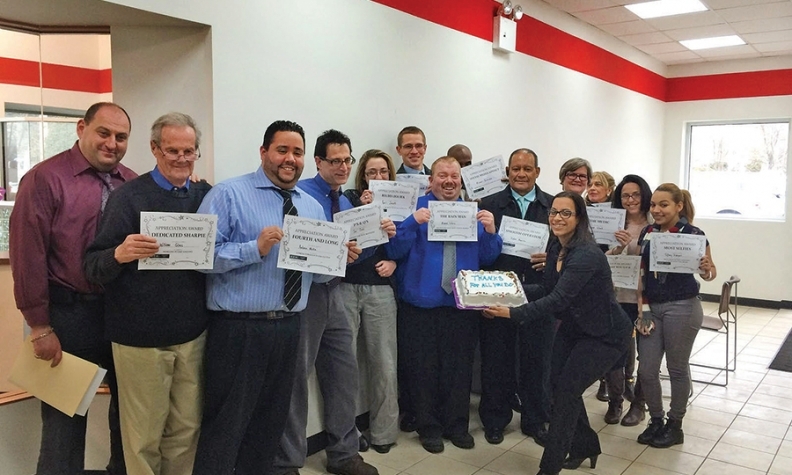 Employees celebrate with an informal award ceremony and lots of desserts. * Naomi Lopez, business development manager, on recruiting: "We use social media when recruiting and communicating with the 18- to 25-year-old group." changes in response to staff requests: "Our team had a huge concern with the condition of our sales facility. In response, we converted a satellite building into a used-car showroom. This change has allowed for more space in the new-car building with improved customer areas. Additionally, new couches and snack machines have helped to spruce the employee conference area. We understand that the key to keeping our employees happy is to make small changes where we can."